Fauxdori Traveler’s Notebook System, Fiscally Responsible? A classmate took note of my fauxdori a week or so ago in class. After some discussion, she brought up something that I’m really surprised I didn’t think of, or consider about these things, she asked me if I saved money with the fauxdori over new notebooks/journals/sketchbooks. I had never thought of it that way. I considered my sketching and journaling method previous to using the fauxdori. I either made or bought a Moleskine pocket sized sketchbook. These have 60 pages and around here cost about $10. As for written journaling I usually did that within the moleskine or in a separate moleskine Volant ($4.50 each) or Cahier ($3.30). * The Volant has 56 pages and the cahier 64. My daily carry cost was between $12 to $15. My current sketchbooks are BanditApple Carnet (BAC) PeeWee. These have 64 pages each. These cost between $3- $3.50 each depending on where I purchase them. For writing I use a Field Notes book and these run about $3.30 each. So I’m spending about $7 on inserts. Clearly there is a savings in just one bundle of inserts. My current rate for filling a BAC is 1 a month. Considering that they have a few more pages than a Moleskine Sketchbook. I’m already saving. 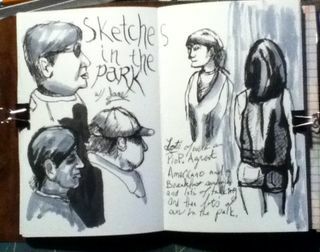 If I were purchasing one Moleskine or HB a month I’d be spending $120 to $144 on sketchbooks alone in a year. I’m filling a Field Notes every 16 to 20 days, depending on to do lists, journaling, and assorted school type stuff. A Field Notes is only 48 pages compared to the volant’s 56 or the cahier’s 64. that being said I always had issues with the last pages of my cahiers falling out and the spine of the my volants tearing and needing repair. I’ve yet to damage a Field Notes to that degree. Part of that is I’m not carrying them around outside of a cover but also, they spend less time in my pocket due to the fewer pages. I’d call this aspect even. The answer to my classmate’s question of a fauxdori being fiscally responsible is, yes, it is. I save about $80 by not buying a moleskine/handbook every month. I also save myself a lot of aggravation. The cover allows the books to really be treated quite roughly. I’m able to carry both books in my back pocket, sit on them and generally abuse them more than I would be able to otherwise. So I’m saved from gluing up spines, falling out pages, and other nuisances. It’s probably humorous that I turn around and spend that saved scratch on other things, like sketching pencils and pens… Right? This entry was posted in Inspiration, Journaling, Review and tagged fauxdori, insert, midori, money, planner, system, traveler, traveller on 20140516 by leslie. 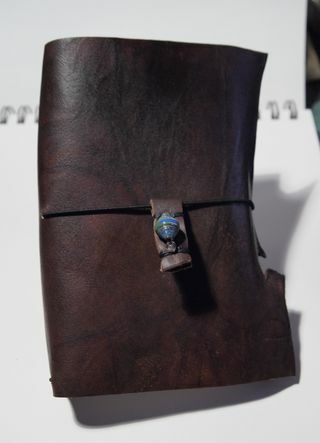 I've been using a knockoff of the Midori Traveler notebook system for about a year now. I decided to make one for a friend and while I was working on it I tried a few things and really liked how it turned out. I then decided to make myself a new one and a pocket sized version. This time instead of punching a hole directly through the center of the cover I made 2 holes, one on either side of the "spine" area. This lets me use a smaller knot and I like how it holds things together. 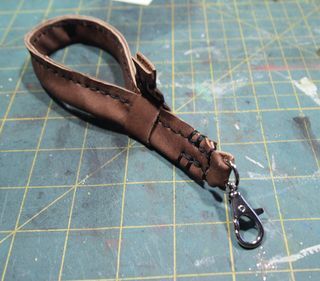 While I was at it, I figured I'd make myself a strap for my camera. I made it a touch too long but I do like it. The hardest part was finding a heavy duty clasp to hold it to the camera. 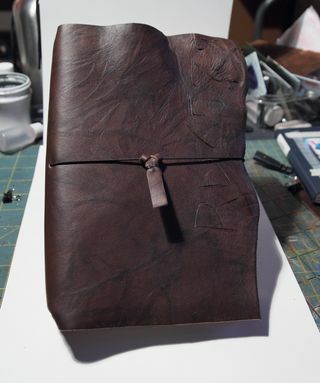 Some construction notes: For thelarge notebook I started with a 9×13 inch sheet of leather and then trimmed it once I had the cover constructed. 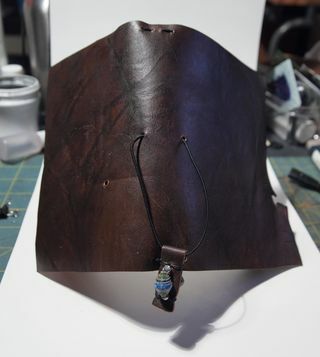 For the small I started with a 6×9 inche sheet of leather, which I again trimmed down excess once I had the elastic installed. 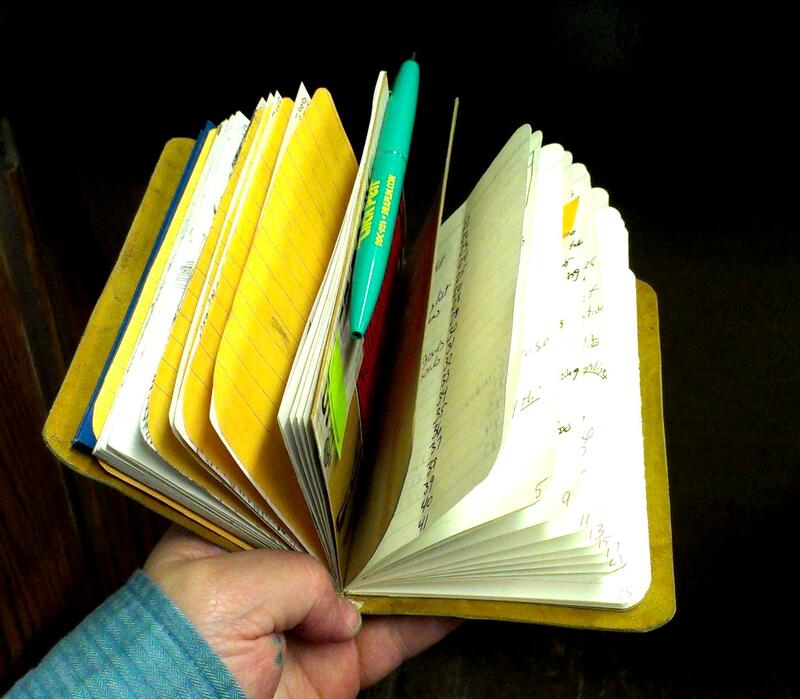 In both of mine I'm using my own notebooks but the small would hold any 3.5×5.5 inch notebook, like a Moleskine Cahier, Doane pocket notebook, Bandit Carnet, field notes etc… Any of the small pocket sized notebooks would fit in the small size, and likewise for the large, any 5.5×8.5/9 inch sized notebook would fit. 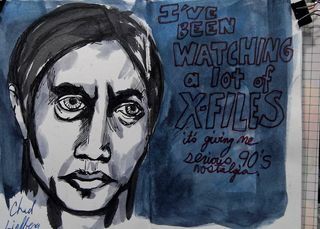 This entry was posted in Inspiration, Journaling and tagged drawing, midori, notebook, sketch, system, traveler on 20120408 by leslie.